A few days ago Christoph Hartmann, president of 2K Games, said that in order for games to push into new artistic territory we’ll need to reach a point where photorealism is possible. In his own words: “To dramatically change the industry to where we can insert a whole range of emotions, I feel it will only happen when we reach the point that games are photorealistic”. So, videogames will only be able to advance beyond shooting and jumping when we can make characters that look very much like real people. Although he’s come under fire from several directions for his comments, Hartmann’s opinions are far from unique – people have argued for years that technological progress will drive artistic progress, that games will take on the role of an adult art form only when they come to look the part. If you’re trying to make a game like Heavy Rain then improvements in graphical capabilities are certainly going to help you out, provided you have the money and the manpower to take advantage of them (and as these technologies advance fewer and fewer developers can afford to take advantage of the cutting edge). Just compare Quantic Dream’s Heavy Rain and their work-in-progress Beyond: Two Souls. 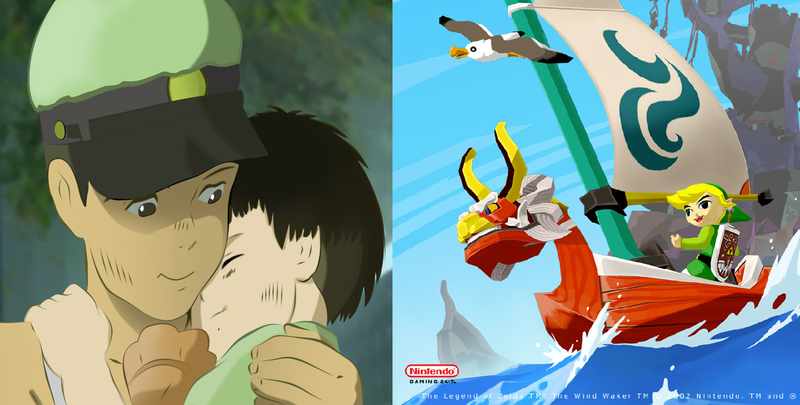 Both cinematic games, both focusing in on characters’ expressive facial and body language. But Beyond: Two Souls already looks a lot more impressive than Heavy Rain. Advances in technology can make games like Heavy Rain look better, making it easier for them to portray emotion effectively through body language. But what of all the countless other games that are shooting for something else? And what of the games that simply can’t afford to take advantage of the graphical cutting edge? Are they somehow precluded from portraying emotion, or telling good stories? Many games, like many movies, just aren’t interested in photorealism. Some of the most emotionally engaging films out there are stylised, animated films. Studio Ghibli’s Grave of the Fireflies clearly looks far from life-like, but does anyone really think that’s a mark against the film? It’s an affecting, powerful piece of work, and whatever you think about the visual conventions of anime you’d be hard-pressed to argue that it’d be inherently better if it looked more like the real world. The same’s true of many games – heavily stylised games like The Wind Waker, pixel art games like Gravitation, text-based interactive fiction games like Emily Short’s Galatea, and more. And there are numerous examples of games with particularly rubbish or average technology behind their visuals that do just fine. Ice-Pick Lodge’s Pathologic is a creaking mess populated by dead eyed mannequins, but it’s also a fascinating, haunting game that’s more emotionally compelling than any number of games boasting advanced graphical technology. Hartmann, like many others, argues that we need to wait for a point where technology opens up new artistic routes. But I’d argue that these routes are already open, and that technology has almost nothing to do with it. Hartmann is, like others saying the same thing over and over again, probably unaware of the people currently exploring these routes, because his focus is on the mainstream games industry, where little of this exploration is being done. He’s a blindfolded man led out into ankle-deep water at the beach, and since he can’t see the ocean in front of him he’s now declaring that this is as deep as it gets. The truth is that we’re doing just fine without photorealism, and while there are huge challenges for the medium to overcome they’re not technological challenges. They’re challenges like Writing Better Stories and ‘finding ways of integrating mechanics with a game’s fiction and themes’. Technology will open up new possibilities, and as a result new challenges, but the possibility of games with an emotional, gripping narrative? The possibility of games about romance, or games about regret? These ideals are already here, within our grasp. We shouldn’t throw our hands up and wait for technology to come along to bring them closer, because this won’t achieve anything. We should focus on trying to reach out and meet these ideals, and then focus on extending our reach even further. This entry was posted in Games Blather and tagged graphics graphics graphics, Photorealism. Bookmark the permalink. Great article and I cannot agree more.